On a warm Saturday in early July, an employee at the Maryland Historical Society placed a call to the police. He had noticed two visitors behaving strangely—a young, tall, handsome man with high cheekbones and full lips and a much older, heavier man, with dark, lank hair and a patchy, graying beard. The older man had called in advance to give the librarians a list of boxes of documents he wanted to see, saying that he was researching a book. At some point during their visit, the employee saw the younger man slip a document into a folder. When the police arrived, they found 79 documents in a laptop bag and took the two men into custody. The younger man was Jason Savedoff, a 24-year-old Canadian-American dual citizen and aspiring model who had attended McGill University. But it was the older man whose identity quickly attracted national attention. He was a 63-year-old presidential historian named Barry Landau, who for many years had moved in the most rarefied circles of American life. According to Landau’s website, he had “served nine Presidents and worked with every White House since Lyndon Johnson’s.” A search for his name in news accounts finds him appearing, Zelig-like, alongside numerous political luminaries: shopping in Georgetown with Alice Roosevelt Longworth, planning a luncheon for Lady Bird Johnson, accompanying Richard Nixon to the Soviet Union, dancing with Betty Ford (and getting cut in on by Fred Astaire), accompanying President Jimmy Carter on the day that he kissed Queen Elizabeth on the lips, escorting Matthew Broderick and Sarah Jessica Parker to the 1997 Clinton inaugural parade. There are photos of him with Nixon, the Fords, the Reagans, with George H.W. Bush and Barbara Bush, and with every member of the Clinton family individually. His 2007 book, The President’s Table: Two Hundred Years of Dining and Diplomacy, received a glowing blurb from Arthur Schlesinger Jr.—“Landau weaves these previously missing links of Presidential history into a fascinating tapestry and narrative of Presidential lore”—and, in the acknowledgments, the author thanks Diane Sawyer, Oprah Winfrey, and Mike Wallace for their encouragement. 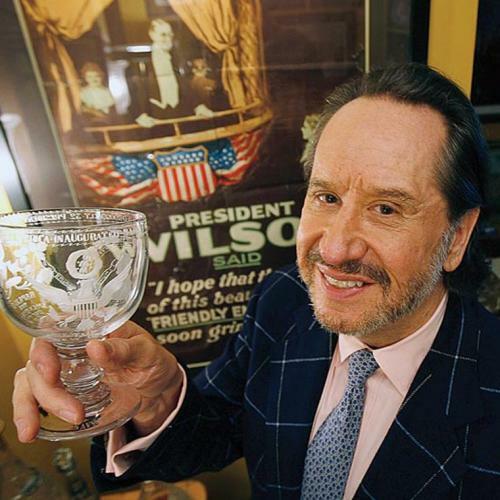 Landau described himself on his website as “America’s Presidential Historian,” but what he was really known for was his vast collection of political memorabilia—some 1.2 million items, by his own count. It included 26,000 menus, a turquoise belt buckle that a group of Indian tribes gave Ulysses S. Grant, Frank Sinatra’s ticket to the 1945 inauguration, an invitation to the birthday party at which Marilyn Monroe serenaded John F. Kennedy, and a key to the White House. In 2005, Larry Bird, a curator at the Smithsonian, told The Washington Post that Landau’s collection of inaugural memorabilia rivaled the Smithsonian’s own. Landau himself begged to differ: “Mine is much better,” he told the reporter. After Landau and Savedoff were arrested, a bulletin went out alerting similar institutions to the thefts, and, in the days that followed, nervous librarians around the country checked their logs to see if the pair had been there. In several historical repositories, including the New-York Historical Society, the Franklin D. Roosevelt Presidential Library and Museum in Hyde Park, New York, and the Connecticut Historical Society, it emerged that they had. Savedoff had used the names Justin Ward and Jason James; Landau had used his own. They had visited the Maryland Historical Society at least once before in June, bringing cupcakes for the library staff. A senior director at the Historical Society of Pennsylvania, Lee Arnold, told The New York Times that the men had come to the library 17 times, giving staffers Pepperidge Farm cookies and donating a copy of Landau’s book. Landau, he recalled, had referred to Savedoff as his nephew. Arnold also told The Baltimore Sun that Landau “had class” and “knew how to conduct himself in a research library” but that Savedoff was “rough around the edges.” His staff had become suspicious after they tried to send Landau a thank-you note, and it was returned to them because the post office was unable to deliver it to the given address. In the days after the arrests, investigators conducted two searches of Landau’s $2,700-a-month rent-controlled Manhattan apartment. Prosecutors said the place was “chocked full wall to wall” with historical artifacts. Investigators found coats and sports jackets with specially tailored, deep interior pockets, as well as IDs that had allegedly been stolen from a New York City gym. They also found precision knives, purportedly used to remove museum markings so that the origin of the documents could not be traced. Police had earlier found a list of 200 historical figures with annotations of the estimated market value of documents they authored. Eventually, investigators removed more than 10,000 documents and gave them to the National Archives and Records Administration, where they could be catalogued and, if necessary, returned to their rightful owners. Late one afternoon, not long after Landau had returned to his home, I called him on my cell phone from a crowded Starbucks near his apartment. To my surprise, he picked up, and I introduced myself as a reporter from The New Republic. Landau told me that he couldn’t discuss his case, but it turned out that he had plenty to say about his life in the political world. Although he sounded tired, and he paused often to cough, he was genial and solicitously polite. Landau explained that he had been going through some mementos he’d planned to send to President George H.W. Bush and his wife, Barbara. “It’s funny, I’m putting my apartment back together, I wonder what George and Barbara Bush think, or Mrs. Reagan,” he said. I noted that perhaps they would not have heard about his arrest, but Landau quickly dismissed this suggestion. “I’m sure Mrs. Reagan knows by now, because we have a lot of friends in common,” he said. Landau has often recounted to reporters the story of how, at the age of ten, he and his mother were at LaGuardia Airport when they saw President Eisenhower arriving. The young boy saluted the president and told Mamie Eisenhower how beautiful she was, at which point she kneeled down to give him a kiss. That night, he went home and wrote the president a thank-you note. The first couple invited him to the White House. While he was waiting for the president to return from a golf game, the young boy made himself at home, marking his birthday on a desk calendar. When Eisenhower came in, Landau chided him for wearing his golf shoes on the wooden floor. During his youth, Landau led what seemed like a charmed life, making fortuitous connections with some of America’s most prominent families. “I went to camp in New England with Jacqueline Kennedy’s brother and sister,” he once explained to The Indianapolis Star. “My parents were going through a divorce, and the Kennedys, knowing I loved animals, used to invite me down to their big estate in Virginia. I met the Johnsons through the Kennedys.” It was his friendship with Luci Baines Johnson, he went on, that led to an internship in LBJ’s White House, which in turn provided the foundation for a career planning White House events. But Landau’s first appearance in the public record was connected to a very different world altogether. It was the dregs of the 1970s, and Landau was living in New York, where he had become a regular at Studio 54. The most famous document of those times is, of course, Andy Warhol’s diaries, in which Landau pops up more than 20 times. Warhol and his friends couldn’t figure out exactly what Landau did. He claimed to be in public relations but seemed to have few real clients. Sometimes, his p.r. work was apparently unsolicited. Warhol writes that Diane de Beauvau, a young French model, told him that Landau had asked her if she wanted to be on “The Mike Douglas Show.” Assuming he was offering as a favor, she said yes. Landau then sent her a bill for $2,000. People called him “Triggerman,” because he was constantly snapping their pictures on his Polaroid. This made a lot of Studio 54 habitués nervous—for good cause, as it soon turned out. On August 28, 1979, Warhol’s diary records, “On the front page of the [New York] Post was a big picture of Barry Landau saying that he saw Hamilton Jordan at Studio 54 asking where he could get coke.” Hamilton Jordan happened to be President Carter’s chief of staff, and the allegations caused a major sensation. And Landau wasn’t the only accuser—he was joined by Studio 54 co-owner Steve Rubell and a drug dealer named Johnny C. The Justice Department appointed a special prosecutor to investigate. But Jordan was never charged. This was in part because Landau proved to be a very unreliable witness. Years later, Arthur Christy, the special prosecutor, recalled to the Associated Press that he became so frustrated with Landau that he shoved him up against a wall. “It was apparent that Mr. Landau was not telling the truth,” Christy said. Landau clearly craved access to the first family. But he may have craved acceptance from Studio 54’s inner circle even more. At the time the Jordan story exploded, Rubell and his co-owner, Ian Schrager, were facing prison terms for tax evasion. At one point, Warhol suggests that the accusations against Jordan were a ploy by Rubell to get a more lenient sentence on the tax charges. “He said wasn’t it great what Barry was doing, and for a second I forgot Barry was doing it for Steve and so I started to say how horrible Barry was, but I caught myself,” Warhol writes. “It’s Steve’s deal with the government—if he gives them names he’ll get a better deal. So Barry’s helping him give names.” The gambit failed; after the Jordan case fell apart, both Rubell and Schrager were convicted on the tax charges and went to jail. After the Jordan debacle, Landau’s life disintegrated. The New York Post reported that he was suing former client Phyllis Diller over a $1,000 bill for publicity work. Calling Landau a “real con,” Diller said Landau had shown up in Los Angeles and Las Vegas uninvited and made long-distance calls from her hotel room. Alice Roosevelt Longworth’s granddaughter, Joanna Sturm, called him a “thief” in The Washington Post—ostensibly, Landau said, because of valuable things Longworth had given him. He was evicted from his swanky apartment on East 66th Street for failing to pay about four months rent. A management staffer who worked at the building recalls him “cowering” in the hallway as the movers carried out a Warhol silkscreen. Over the next decade, Landau worked hard to reinvent himself. By the 1990s, he had become a fixture at political collecting shows, often accompanied by his black standard poodle, Topper. Landau doted on Topper; a friend who knew him during the ’90s told me that he would sometimes ask the French restaurant on his block for steaks and hamburgers to feed him. But, in private, Landau was struggling. His mother became very ill. Eva Landau had been a source of unfailing encouragement ever since he was a child. “She told me if I sang ‘Jingle Bells’ in the snow, I would never fall down, and throughout my life if ever I thought I did, she was always there to pick me up,” he once wrote. He took her illness very hard. Despite his whirling social life and his impressive Rolodex, Landau was desperately lonely. Sometimes, he sought comfort from the prestigious people he had cultivated. Arthur Schlesinger’s wife, Alexandra, told me that Landau had once taken her to a function for the Clintons, and later her husband had lunch with him; occasionally, they would cross paths at social events. Although that was the extent of their relationship, he would sometimes call to talk about his mother’s health. “I think maybe he just didn’t have any friends, and this was to him like maybe having a friend,” she says. By that time, Landau was frequently sought out as a media commentator on presidential matters. He often appeared in a three-piece suit with a white vest, bearing exquisitely chosen props from his collection. On the “Today” show to discuss the wedding of Chelsea Clinton (a “loving, loving girl”), he displayed a silver, engraved token that Jackie Bouvier gave to her bridesmaids. On “Good Morning America” to discuss Ronald Reagan’s funeral, he brought a ticket to Lincoln’s funeral and the program that was handed out at FDR’s. He brought china to Martha Stewart’s show, and the two joked about Mrs. Lincoln’s habit of smuggling tableware out of the White House to give to her relatives. “I wondered where all the china went!” Stewart exclaimed. “The rest is at my house!” Landau replied jovially. One person who regularly saw Landau at memorabilia shows says he would push other collectors aside to elbow his way to a table. Others told me he would trade on his stature to obtain press passes to shows, allowing him to get in early and scope out the best items while other dealers were waiting in line for tickets. Sometimes, he told people that he was a producer for CBS’s “60 Minutes”—perhaps hoping to pass for a CBS producer by the name of Barry Lando. Eventually, the network sent Landau a cease-anddesist letter telling him to stop impersonating its employee. One weekend, I visited the Antiques Garage, a Chelsea flea market that Landau had frequented for many years and where he was well-known to the dealers who manned the booths. Several months before his arrest, Landau had started attending the market with an attractive young man—Jason Savedoff. Savedoff hailed from the upscale Vancouver neighborhood of Kitsilano, where his mother owns a $2.3 million house (his parents are divorced). He enrolled at St. George’s School, a posh, all-boys prep school where students wear gray slacks, ties, and blazers, and are expected to go on to Oxbridge or the Ivy League. Like any school, St. George’s had its cliques, and Savedoff was one of the smart kids. He spoke French well and was an accomplished violinist—but he was also a hip-hop fan who liked to beat-box and wore a silver chain around his neck in defiance of the school’s dress code. His reputation was “smart, chill, but a little bit aloof,” a friend recalls. Another schoolmate, Ben Wilinofsky, wrote to me in a Facebook message: “He was obviously very smart, and he had this way of being social that was a little too smooth; frictionless, almost. He was friendly with everybody but I can’t think of anybody he was really close friends with.” He attended college at McGill, where a fellow student recalled that he stood out for his superior attitude. “If you were talking to him, you would just feel like you weren’t a high priority,” he says. Willard says that, like most models, Savedoff obviously needed the extra money from his waiting gigs—usually around $90 to $150 per event—and would bug her for his checks. Then, in December 2009, a year before the alleged thefts began, Savedoff stopped asking for work. “All of a sudden, he just didn’t need to be booked anymore,” Willard recalls. One of the most disturbing lessons of the Landau case is that it is not terribly difficult to steal valuable historical documents. At a court hearing, I met Paul Brachfeld, the inspector general of the National Archives. Brachfeld, formerly of the Secret Service, founded the agency’s investigative division, which is assisting the FBI with the case. It is the most exciting thing he has worked on since former National Security Adviser Sandy Berger got caught stuffing classified documents in his suit jacket. Brachfeld told me that the National Archives possesses as many documents as “flecks of sand on a beach.” The collection is so vast, in fact, that the agency doesn’t know exactly what it owns. Then there are the millions of documents housed in historical societies and universities across the country, where archiving and security procedures vary wildly. Bruce Gimelson, a dealer of American historical documents and paintings, was once doing research at a sizeable institution when he stumbled upon a letter from Thomas Paine to Congress that had been incorrectly catalogued and which he estimated was worth $50,000. At one point, the three librarians went to lunch, leaving Gimelson unsupervised in the reading room. So far, prosecutors say that investigators have found the true owners of 2,000 of the 10,000 documents that were seized from Landau’s apartment—meaning that the scale of the evidence against Landau has expanded significantly from the number Landau and Savedoff were initially accused of stealing. Investigators assumed that the men planned to sell these artifacts. John Reznikoff, a dealer of historical documents, told me that Landau called him on December 13, 2010, offering to sell some speeches by Franklin Roosevelt. “We were willing to pay thirty thousand dollars, and somebody else ended up buying for thirty-five thousand. Thank God, because it turned out they were stolen.” Prosecutors say these same speeches were indeed sold to another dealer. At first, both men pled not guilty to the charges. In late October, however, Savedoff appeared in court, immaculately dressed in a gray suit, and changed his plea to guilty. His plea agreement describes a “subservient relationship” between the two men. Savedoff told prosecutors that, under Landau’s direction, he researched the location of the documents online to target them for theft. They then visited numerous museums “posing as researchers.” At the Maryland Historical Society, Savedoff said, Landau “undertook actions designed to distract museum staff” while the pair stole documents. They often removed the card catalogue entries for the documents to make it harder for museums to notice that something was missing. After Landau’s arrest, the people in his orbit started wondering whether all of his fabulous stories had really been true. His social web was nearly impossible to untangle. Landau did attend many high-society events and met, at least fleetingly, countless presidents and celebrities—he has the photographs to prove it. “There was no one [Landau] didn’t claim to know. You just didn’t know whom he did and whom he didn’t,” says Chaffee, the Washington Life editor. In a note dated three days later, the president’s secretary, Ann Whitman, replied: “The President asked me to thank you for the friendly interest that prompted your recent letter. At the President’s request, I am happy to send you the enclosed White House card. It comes with his very best wishes.” Although the details change in Landau’s multiple retellings of the story, it usually ends in a visit to the White House. But Whitman’s letter reads like a form response, and the Eisenhower library has no record of Landau ever visiting the White House. A year later, Landau wrote again to Eisenhower to ask for his autograph and makes no mention of either meeting the president in person or visiting him in Washington. However, Maria Downs, a former social secretary for Gerald Ford, says the extent of his relationship with the White House was to attend one state dinner as the guest of another guest. “He never had a job in the Ford White House,” she said. “He must talk a hell of a good song to fool so many people.” Nor did he work for the Carter administration, according to the Jimmy Carter Library and Museum. He claimed to have witnessed Carter kiss Queen Elizabeth, but the library said there was no record of his presence at that meeting. Selwa “Lucky” Roosevelt, a former chief of protocol under Reagan, told me Landau had not worked in her office, and Gahl Burt, a social secretary in the Reagan White House, wrote in an e-mail that Landau had nothing to do with the White House during her tenure. During that conversation, I decided to make one last effort to meet him in person, and I asked if I could send him some magazines. He demurred but, perking up, told me about a place in the Le Parker Meridien hotel nearby that served “the best hamburgers.” He asked for a bacon cheeseburger and a vanilla shake, and promised to pay me back. I got the food and made my way to his building. The lobby has marble floors and is decorated with chandeliers, paintings, and plush furniture. When I reached his floor, Landau was standing in the doorway of his apartment. His feet were bare and he wore loose gray sweatpants and a t-shirt that read, “if you want a friend in washington—get a dog.” Sweat was collecting on his temples and he breathed heavily, as if he’d run up a flight of stairs. He took the food and apologized for not inviting me in, explaining that he was not well. Still, he was watching me keenly. At one point, he commented on the way I was standing and asked me if I was a dancer; at another, he pointed to the ring on my finger and asked if I was engaged. This, I came to realize, was how Landau collected people like he collected objects: by amassing tiny details about a person that could be used to convey a plausible sense of familiarity when he spoke about them to others. Not long afterward, I asked Barbara Bush about Landau. She remembered meeting him but said he was not close with the family. “He was a namedropper,” she said. If Landau is guilty, the question of why he might have stolen a vast trove of historical artifacts remains something of a mystery. If he and Savedoff intended to profit from the sale of historical documents, they seem to have made curiously little headway. And Landau is hardly a rich man. His lawyer told the court that his bank accounts contained about $1,600 after he had paid his rent, and his 2010 tax returns showed an income of just $11,000. In October, Landau obtained permission from the court to sell an Andy Warhol print in order to cover his expenses. Eliza Gray is an assistant editor at The New Republic. This article appeared in the December 29, 2011, issue of the magazine.